Perhaps a strange confession for this digital space of mine, I must admit I’m a real fan of tangible reading materials. I love to smell the pages of a musty old novel or graze my fingers over the cover of a shiny new copy of Real Simple. So I subscribe to a couple of in-print magazines. I love devouring the recipe photos in a brand-new issue of my favorite mags – flashing through a month full of new ideas for things to cook and eat. I try so hard to savor each article, not looking ahead to the most interesting ones but rather reading it like a book to make it last longer. Recipe reading is I’m sure a guilty pleasure I share with many in this community of food bloggers and readers. (When I can’t sleep, I often sit on the loveseat and read the beastly (in size) Vegetarian Cooking for Everyone by lamplight until my eyelids get a bit heavier.) But many times a recipe can be just that, reading material. Then there are those times, there is that recipe, which jolts you into must-make-this-immediately mode. Well, for whatever reason these quinoa burgers, featured in Whole Living's grilling feature this month, hit that button in me. I made them as soon as I got home from work (I sometimes get to read my magazines at my job!) I switched out some ingredients because I didn’t have everything called for on hand, but I feel like these turned out so delish that I’d definitely make these alterna-patties “my way” again. The original recipe uses kidney beans; I used black. I also subbed Vidalia onions for shallot, crumbled goat cheese instead of feta, whole eggs instead of whites, and added cornmeal to dry up the mixture a little and make patty-formation a much easier feat. I melted Wisconsin cheddar onto a whole-wheat tortilla in the frying pan and then folded the hot tortilla around the burgers. If I’d had avocado, it would have been a big-money addition to this sandwich. I must say though, these turned out great. 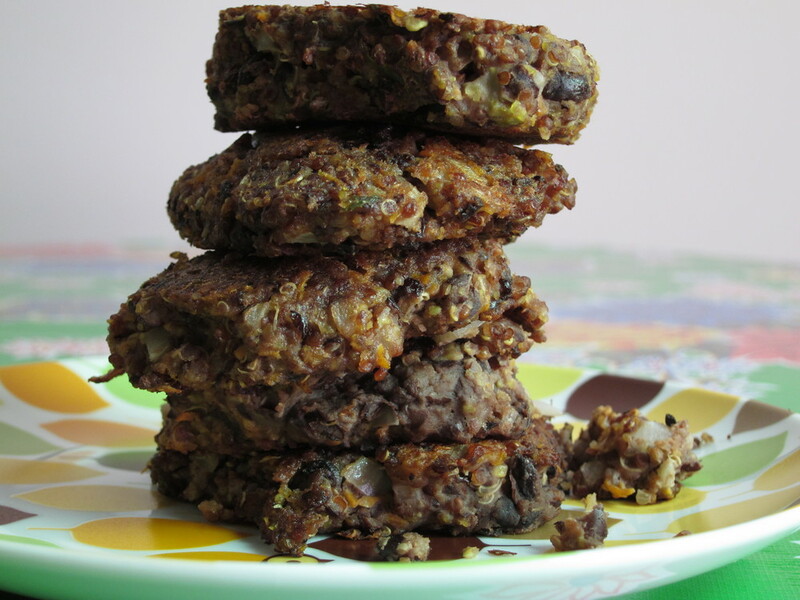 They were everything I want a frozen black bean burger to be but never is: fresh-tasting, bearing a perfectly crisp exterior and soft, warm interior. Perhaps it was the lack of hydrolyzed soy protein or maybe just the way I formed them by hand and cooked them so lovingly in their wading pool of olive oil. I like that you can really taste the beans, because I sure like beans – quinoa boldly offers up its winning texture while grated carrots and goat cheese lend crunch and creaminess respectively. Try these – even if like me, you don’t have a grill. Eat them outside if you can because everything tastes better that way. The burgers are not too hard to make, and with a side of roasted veggies and perhaps a watermelon wedge, they make a darn good meat-free Monday supper. I recommend making extras so you can heat one up whenever you need a quick lunch this week! 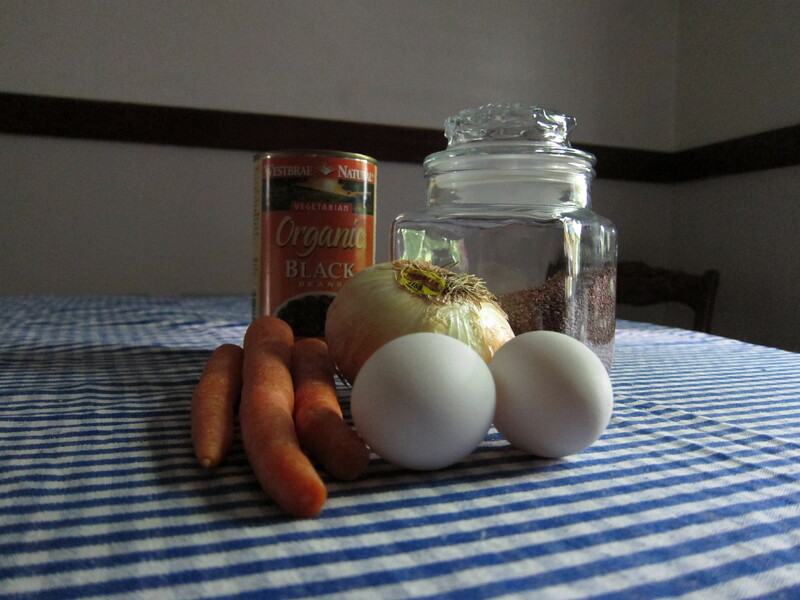 In a biggish bowl, mash black beans into a thick paste with a fork, then mix in onion, carrot, cooked quinoa (slightly cooled), goat cheese, salt, and eggs. Incorporate cornmeal by the tablespoon until mixture resembles something you could make patties out of (not runny). 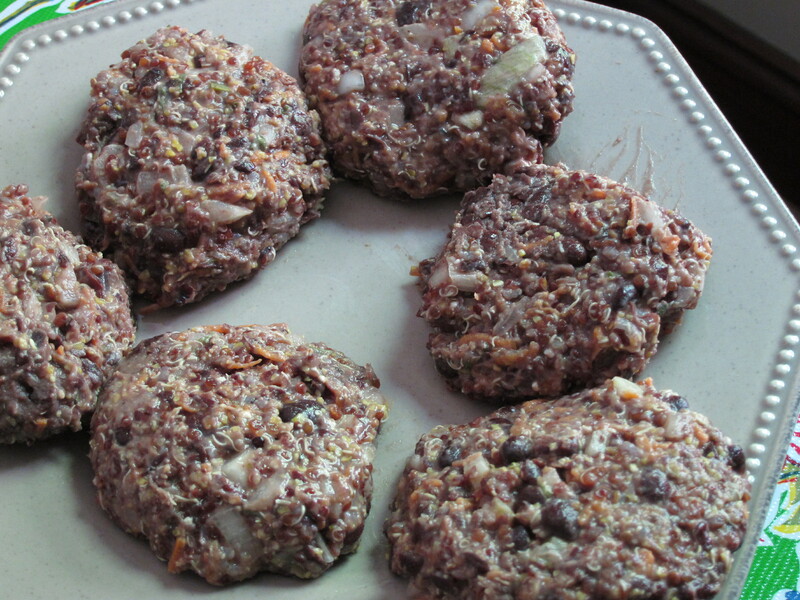 Form mixture into six or so patties and allow to chill out in fridge for 30 minutes on a wax paper lined plate. Heat 1 tablespoon oil in a frying pan over medium-high heat (or directly on grill grates if you are so lucky and inclined) and cook patties until golden brown (add remaining tablespoon oil if cooking in batches), 4 to 5 minutes per side. Remove burgers to paper towel lined plate. Turn heat to medium/low, warm tortillas in same pan, sprinkling with cheddar, until cheese is just melted. 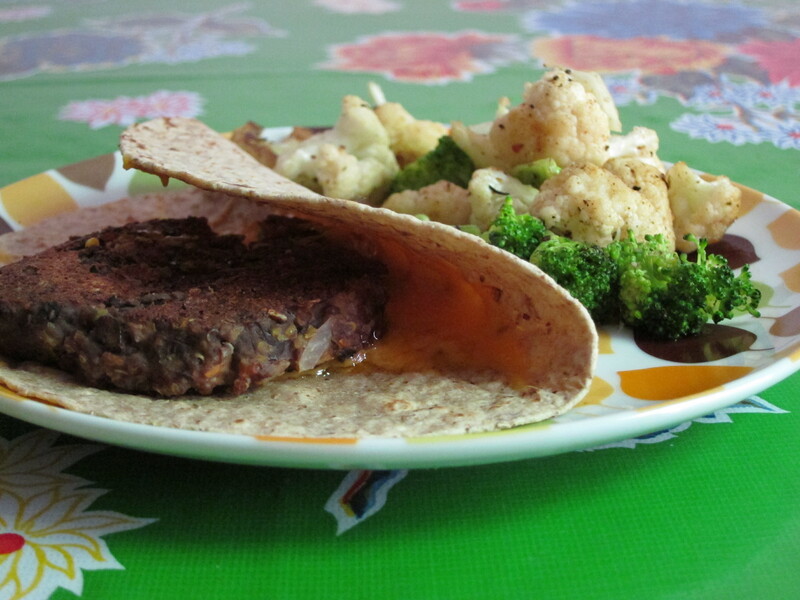 Serve burgers snuggled inside the tortillas with slices of avocado to your liking. Note: you can cook all the burgers right away and just heat up leftovers, or leave remaining patties uncooked until ready to eat to ensure crisp burgers each time.